I’m not normally one for writing you letters, but I wanted this to be about me sharing a special memory with you and not just documenting it for the sake of sharing it with others. Last week, you asked me if you could go hunting with me. You see, ever since I got my deer last year, you have been so curious about it. So, last Saturday, your grandad and I took you out on your very first hunting trip. The days leading up to the hunt, we talked about it a lot. You asked me if you could shoot my gun. I told you maybe next summer when you were bigger. Your eyes twinkled. You were shocked to hear that you already had your very own gun. We talked a lot about safety after that. What you can and cannot shoot. Where you always point your gun. What colors we wear when we’re out hunting. Things like that. We want you to be safe, my love. When the day finally came, you were so excited. 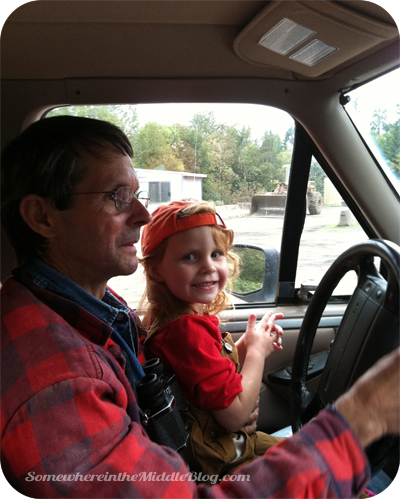 You got to drive the gravel roads with Grandad. You glassed clear cuts with binoculars right alongside Grandad and me. You carried your ear protection with you…just in case. For the most part, you were quiet. At one point, as I was walking ahead of you and grandad, all I could hear were your little boots pounding on the gravel road and you whisper-yelling “wait up!, wait up!”. I turned around and squatted down and you ran to me with a big smile. We’ll continue to work on that as you get older. :) After a while, you were ready to be done, but you were such a good sport when we kept going. It’s about getting outside. It’s about breathing in the crisp fall air after a rain. It’s about seeing the sun rise. It’s about being a responsible hunter and practicing your shots. It’s about respecting nature and all of God’s creations. It’s about respecting your quarry enough to only take a clean shot – no matter how big the antlers are. It’s about keeping as much meat as possible to help provide for your family. It’s about spending time with those you love – even if it is in silence. It’s about passing on traditions and passions. It’s about realizing what a blessing it is to have the ability to enjoy all of these things. Some of these things you’ve already learned…some of it will come with time. I’m looking forward to teaching you and showing you more. I hope your excitement never fades and that the twinkle in your eyes never dims. I am so proud of the person you’re becoming. I love you so much, sweet girl. This entry was posted in adventure, Boots, family, growing up, Letter to my girls on October 20, 2011 by katherine. I married in to a family of hunters. And as a mother of three girls, this is a nice perspective. THATS AWESOME! Good job mom! Just plain Awesome! Just had a little treat in my eye. Pingback: Rylee Get your Gun!